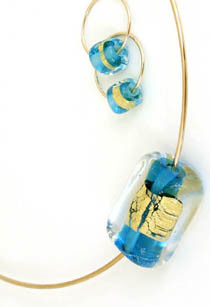 Fused Art Glass, Art Glass Beads and Kiln Formed Glass Art Jewelry. 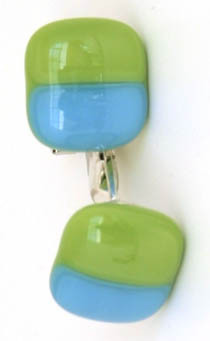 Fused Art Glass Used in Hoglunds' Kiln Formed Glass Jewellery. 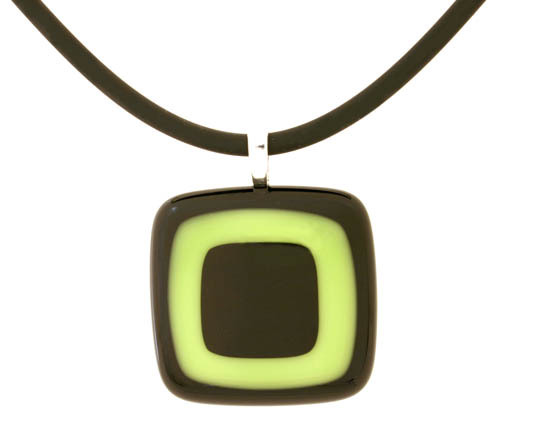 Marie Hoglund develops her fused art glass jewellery after carefully choosing strips or sheets of coloured glass, which might be harmoniously similar in colour or strikingly contrasted. 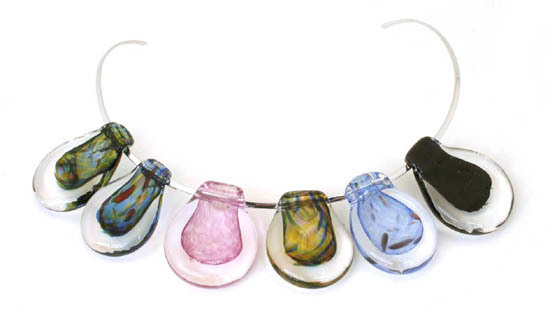 Her fused glass jewelry takes shape after she cuts selected pieces of flat glass to shape and then melts them in the glass kiln to a temperature where they begin to melt and fuse together, becoming one piece. The kiln temperature is then slowly reduced to avoid cracking of the piece. 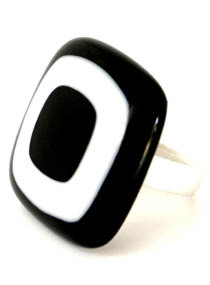 The result is stunning jewellery, which is flat on the back (where it sat on the kiln shelf) and curved on the front, usually with rounded corners for a smooth feel. 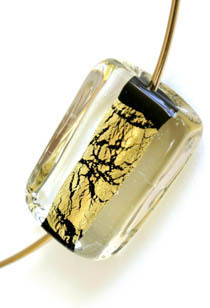 If Marie is making a glass jewelry pendant she will then polish any uneven protrusions and attach findings, through which rubber cord or silver or gold chains or wire may be threaded. Earrings and rings are also fitted with suitably elegant, high quality sterling silver findings. 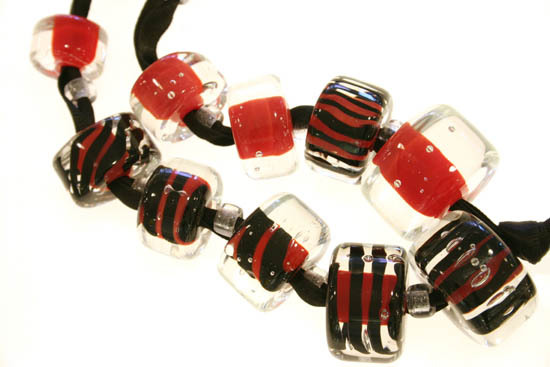 As well as fused art glass jewellery, Marie also enjoys making various sizes and shapes of glass beads using flame work (also known as lamp work) processes. This is where a gas flame is directed onto a piece of glass, which has been picked up on a metal mandrel and rotated in the flame. Sometimes extra pieces of powdered, coloured glass are added and then moved to make a pattern before being shaped as required then cooled. The metal rod around which the bead is formed then leaves a hole through which rubber cord or wire is threaded to make necklaces or bracelets. 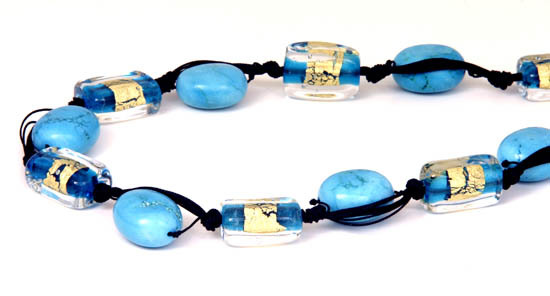 The core of the lozenge shaped beads in this beautiful necklace, above, have been worked with the flame using turquoise coloured glass, then encased with 24 carat gold and crystal clear glass to complete them. You will notice that each bead is slightly different in size and shape;I just love this piece! 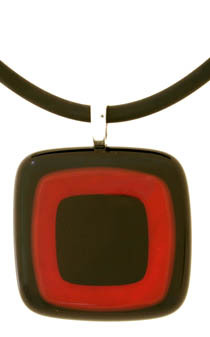 ...and how smart is this black, red and clear flame worked glass necklace? 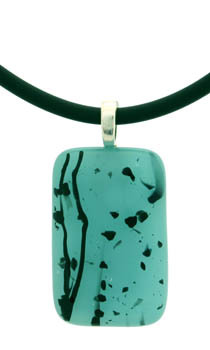 But Ola is the expert when it comes to making jewellery from molten glass, directly on the blowpipe. 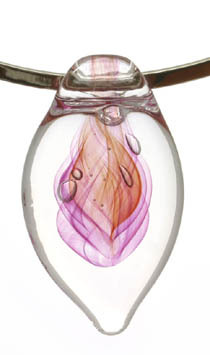 Picking up a small piece of molten, clear glass on the end of his blow pipe, along with several pieces of coloured glass, he twirls it in the furnace until it glows red hot. Using wet newspaper or a wooden paddle, Ola then flattens the bubble shape and flips the smaller end over on itself to form a gap, through which a chain or wire can be threaded after the piece is cooled and polished. And voila! 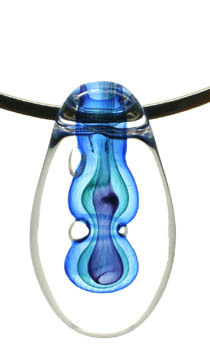 There is a gorgeous 'one-off' handmade glass pendant - made just for you! And for something ultra special, see what happens when several are threaded together to make a necklet! Glass making has a long history, dating back to at least 1400 BC. Processes and formulas were a closely guarded secret amongst practitioners and were handed down from father to son or from master to apprentice. Since the advent of tertiary art courses of recent decades. much of the knowledge about basic techniques has been shared. 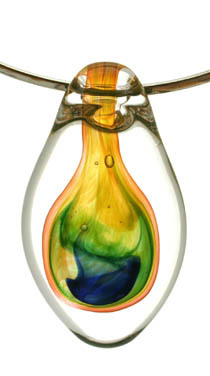 But of course, to become an artist in glass is not merely about learning techniques. Isn't this necklet spectacular? 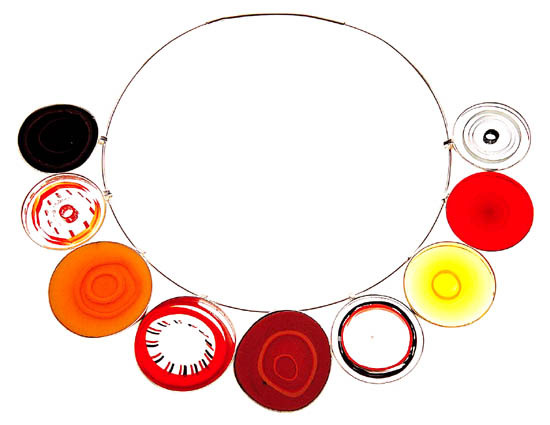 Made from cut and polished glass discs encased with sterling silver, each disc could be worn as a separate pendant. Which is your favourite? Please note that jewellery featured on this page, although representative of the artists' past and current work, is not necessarily available for purchase. Please check the Hoglund Art Glass website for current stock. Would you like to be the first to know about Arts matters in Tropical Australia, free stuff, painting tips and so on via the bi-monthly e-newsletter, 'Perspectives'?